Chef Tim and The Sidecar Restaurant - All Aboard! I just communicated with Chef Tim at the Sidecar Restaurant in Ventura. 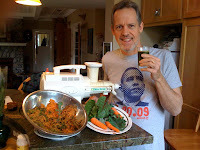 He is a committed participant of Locavore Lite 2010 and a proud supporter of the project! Tim has been using lots of great local food for a long time. Please check him out at: http://www.thesidecarrestaurant.com/ , and let him know how much you appreciate his support of local food and Locavore Lite 2010 ! 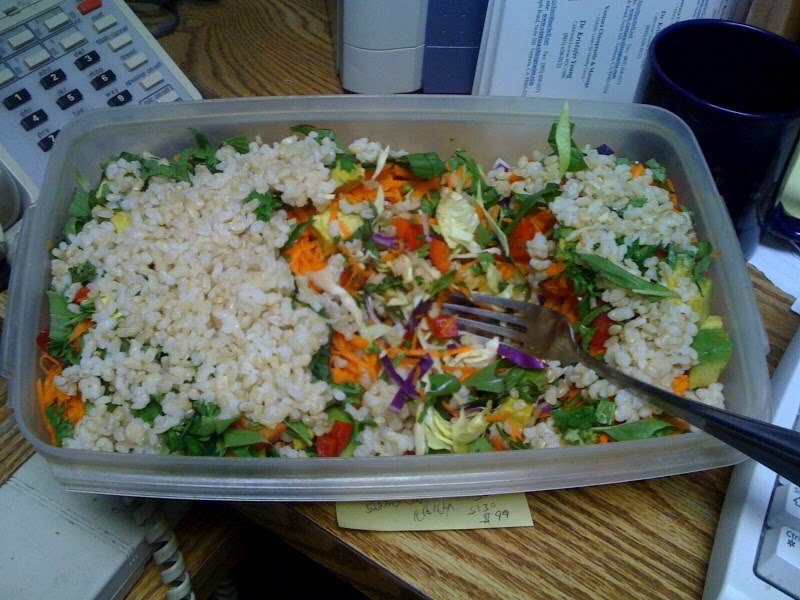 Butter lettuce, red cabbage, green cabbage, carrot, white onion, red bell pepper, avocado, basil, parsley, brown rice, lemon juice, salt, not a drop of oil, - the best!!! Joanne, my wife, and I made this salad this morning to take to our office for our lunch. The picture you see is my salad; Joanne has her own. And every bit of it local! And there I sit, full and satisfied! Another first for us in this locavore year! 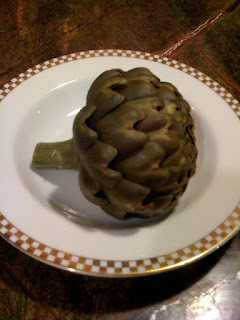 Yesterday we ate our first 3 artichokes. And were they delicious! Most of the leaves we ate with nothing on them. There is no such thing as local mayonnaise from the store, and we haven't made any. We did have a bit of butter on the hearts. The plant is also beautiful. We have 11 more young flowers on the plant. We will let one go to seed. We are 4 and 1/2 months into this project and I am still so glad to be doing it. Ouch! I haven't posted in over 2 months. Well ... it is springtime, and the farmer, I, am busy in the field (backyard). Please know that my absence is not for lack of love for sharing with you. I love their promotion of - yard sharing !!! An idea whose time has come. Finally, we, the core ELOY are now down to 12 participants, from 21, and are one third of the way through our project year. Wow! Has this gone fast! Just started, and our project is 1/6 over. No question, this year will be a breeze! So, where was I? 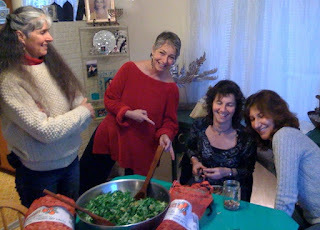 On Feb 22 we had our first "core" potluck since our Jan 1 launch party. What a great time and GREAT all-local food!!! 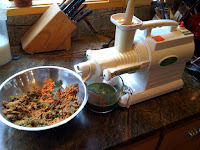 It was so interesting to hear how life was for other 100-mile locavores. How good it feels to be with others who understand. In this second picture you see Steve Beebe of Quarter Mile Films working on our documentary. 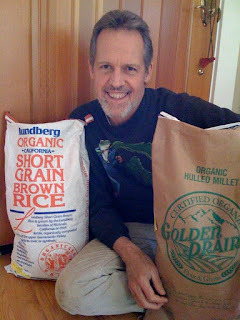 In January and February, one of our (Joanne's and my) exceptions, was brown rice. Got to buy it in bulk - 25 lbs. This month, March, we are using millet as our grain exception. We are ready for the next 30 days. 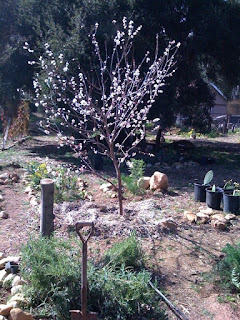 The picture above may look to you to be a beautiful blossoming apricot tree in my back yard farm. But, from the eyes of a 100-mile locavore on March 1, it looks like the place from which I will be picking delicious apricots in the summer. Not a lot of difference, but notice how I am not in the moment. Finally, remind me to speak to you of coffee. :) Next time. Is there anything immoral about not posting for 13 days and then posting a rash of short posts within one hour so that on average you have posted once-t every 3 days? I hope not; cuz it makes me feel better. 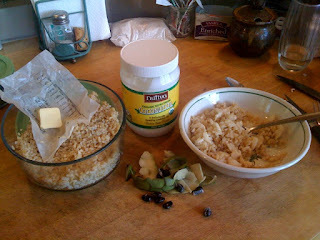 This is a great breakfast dish! And, when I'm hungry, it is great any ole time. Brown rice and coconut are 2 of my 3 exceptions for February. Local Orange Julius - HOT! First, let me tell you that there have been plenty of occasions in the last 7 weeks when I have had something to eat or drink, and it just didn't feel complete; not all there. Well, sure, no bananas, vanilla, cinnamon, mayonnaise, mustard, peanut butter. I could go on. 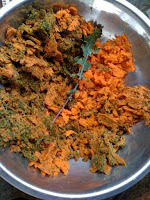 A couple of weeks ago I hit on a great all-local recipe that left nothing to be desired!!! Nothing!!! 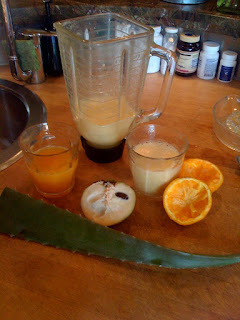 Blend thoroughly and drink. 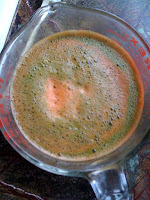 Trust me, as you consume this luscious drink, not once will you bemoan being on a year-long locavore project called Eat Local One Year. and enjoy the juice of your labor!!! And since it has been a whole week since I have posted, I will also spill the beans and the eggs. 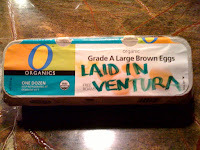 We just recently found organic beans from a farm in Carpinteria. I think we got limas, pinquitos, and great northern beans. 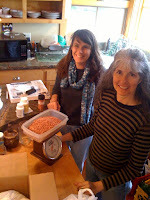 Here are Kathy Nolan (core locavore) and Joanne, weighing out beans. The story with the eggs is that we had an all-local potluck at our house on the 5th and invited our friend Eric Webalowsky. Eric brought eggs from his own personal chickens, and brought them in this recycled carton. Well, it is Feb 1 today, and we have completed one whole month on our 100-mile diet!!! 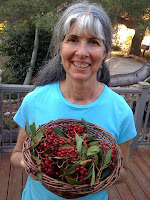 Today, Joanne (left) went with Kathy Nolan, one of the loving core members of ELOY (Eat Local One Year), up to Matilija Canyon to pick Toyon berries. Local and expanding our diet! Both good! 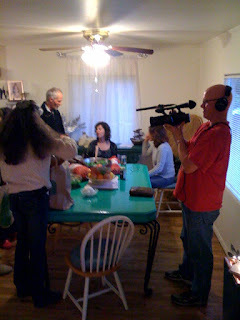 The ladies also had our documentary film crew with them. We are so grateful to Steve and Briana Beebe (Quarter Mile Films) for documenting our journey!!! We also really like them and Eva and Sadie! I should probably tell you that I screwed-up this morning. I ate 3 tablespoons of of non-local pinto beans. But, I can tell you how it happened. For January, my 3 exceptions were brown rice, pinto beans and coconut. Well, yesterday, the last day of January, we ate pinto beans, and had a few left over that we put in the fridge. This morning, I mixed up some brown rice, potatoes, and a few pinto beans for my breakfast. I wasn't thinking of today being a change to new exceptions, and I was thinking of the pinto beans as something that was OK to eat. Wrong. Joanne came into the kitchen and gently said, "why are you eating pinto beans?" While I may not be perfect, I am forgiven; and not just by Joanne. I don't believe that the ELOY core has had a discussion of how to handle such transgressions, as my pinto bean transgression, but I have gotten the sense that the group favors being gentle with such mistakes. We will surely be discussing it now that I have made it an issue. We have found local organic beans (limas, great northern, pinquitos), so we don't need to use pintos as an exception for February. My 3 exceptions for February are brown rice (we didn't plan ahead enough to order 25 lbs of millet - we'll do it for March), quinoa, and coconut. Lucy Martin make the connection for us with Buttonwood Ranch, and picked up local almonds. These ones come with the husks and the shells. I bought 10 lbs and haven't had a chance to open any yet. Thank you Lucy! The almonds are yet another of our finds of local foods that expand our diet and make this project SO do-able! I wrote myself a note on 1/20 saying that it was still hard being off of coffee. That seems to be easing up. In the last 5 days, I have been feeling more comfortable without coffee and thinking about it very little. Tomorrow I will be having my second non-local, exception meal. (The rule book can be found at: Guidelines .) I am interested to see how I will feel after some non-local and a couple of cups of coffee. I know .... you are wondering what in the heck that title means. Well, each of us core-locavores lives by the Eat Local One Year Guidelines - guidelines . Within the minimalist guidelines that we have sworn to, is the option that we may eat 2 meals per month that are not local food. My excitement was so great with the election and inauguration of our new president, that I just HAD to get out and party with other LOCAL folks who themselves were thrilled by the change that we are creating and experiencing. 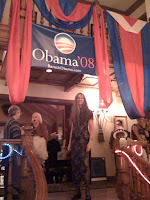 So, Joanne and I went to the Inaugural Ball in Ojai, hosted by Darakshan Farber. What a great time! What great live music! What fun dancing with Joanne! And, I ate and drank at the Ball. The things I consumed were not local. The 3 rum and cokes surely were not local. Neither were the peanuts, corn chips, and ribs. So this was my first of 2 exception meals for the month of January. I've got one exception left for January .... you'll see. Did I tell you what I decided on for my third exception? Coconut. I love the oil and ought to buy myself a nut. For review, #1 is brown rice and #2 is pinto beans. Recently found myself wondering when my cactus plants will start leafing. Love those nopales! When it does leaf, I plan to teach a class on prepping and cooking them. A young patient of mine is a professional fisherman. He and I are going to work out a trade. Should be delicious! I am going to use my first total-meal exception tomorrow night at the Obama Inaugural Ball in Ojai; two major historical firsts in one day. My brother, Kap, owes me a birthday lunch from last October. That will be my second meal exception for January. We are already almost 3 weeks into this 52-week project. This year is sure to fly like the wind. I am definitely experiencing some challenge doing this project. But, it is good. I like the palpable nature of the everyday, every meal, every snack awareness that is required. I realize that I want to make a list of the local foods that are available to me in January. I'm already looking forward to the fruit from my loquat tree. Stay tuned, or just be turned. If I don't get with the program, I will be left with a total of 13 blog entries during this calendar year! Rest assured, it is not that I lack what to say. 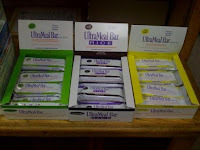 For example; we, my wife, Joanne, and I, bring our lunch to work with us, but often, last year, it was not enough and I found myself eating one or more of these high quality and delicious bars that we sell at the office. And, you are correct, they are not made locally from local food. Not only are they out for us for the year, but they are sitting right in front of me every day when I am feeling a bit peckish. I must keep my guard up and bring tons of great food to eat. My only real hope is to bring lots of food. My guard is not well developed. 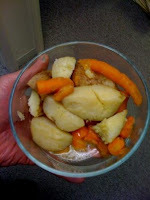 These gorgeous potatoes and carrots are the kind of tasty stuff that I need on hand. 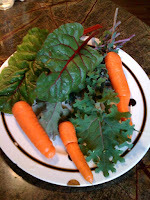 We have a great, little, all-organic, health food market and cafe in Ojai, CA call The Farmer & the Cook. They have their own farm, which is where this arugula came from. 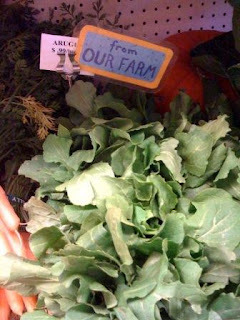 I don't know if Steve and Olivia (the farmer and the cook) put up this little sign on the arugula for us, but it is appreciated and helps when I cruise through the store to pick up only-local food. I am hoping that they will offer to host an all-local dinner night one of these nights this year. I would like to find/make some direct connections with fisherpersons who catch fish within 100 miles of Ojai. I would love to add some fish to my diet. I used to eat sardines regularly, and miss them. Seaweed is another interest of mine. I would love to learn about and harvest some off our coast to use in/as salad. Are you a person who can help me with these opportunities? Even in a few short days, a guy could get feeling kind of hungry. My 78 year-old Mom lives with us. We are not making her do the Eat Local project. At the same time, she is unable to care for herself and get her own food. 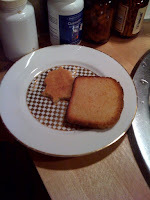 Well, the other day, after she was done eating, this whole piece of toast, and the nibblet, were sitting on the counter. Boy was I drawn to them. I lusted for them a little. But, I stood my ground and stuck to my principles. Not a close call, but an interesting experience and a sign of challenges yet to come. 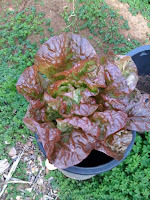 I don't know if it is real redemption, and since I hadn't fallen, maybe it doesn't really matter, but I went out into my gorgeous vegetable garden and picked this spectacular head of red lettuce. Again, maybe not redemption, but clearly uplifting. I definitely need to do more of this to keep me from the possibilities of the toast; which by the way, I guess I didn't mention, is NOT local. You may have noticed that this is a daily blog that may happen every other day. Doin' my best. So much to do! Happily! Hands down! Coffee is the most difficult thing for me to be away from. I am surprised how powerful the draw and how powerful my imagination that it would feel good to have a cup. And it is not just in the mornings. Though this is not exactly comfortable, being away from coffee, I am glad to be doing the experiment. I wonder if coffee has allowed me to be able to push myself too far, and now I am creating the opportunity to move back into some degree of balance.